You need to keep up with best practices. And you have storage issues NOW. Whether it’s planning, prioritizing, or educating you about your readily available options, we can help. Lack of funds doesn’t mean a lack of solutions. Funding. It takes time to acquire, but inside your evidence room, you need those funds yesterday. After all, a small law enforcement agency has the same base requirements and best practices as a large agency—especially when it comes to maintaining your evidence’s chain of custody and storing it safely. If you’re struggling with a lack of space in your evidence room and a new building or addition is still several years away, there’s a way to create additional space and still maintain best practices—and that’s to prioritize your needs and work through it with a phased approach. One example? Utilizing a modular high-density mobile storage offers a way to compact your evidence inventory with space-efficient shelving in a way that fits your current budget. When your budget allows, additional carriages can be added on—and in the event of new construction, the system can be easily relocated and reconfigured to best fit your building’s needs. It doesn’t just stop at compacting your storage. We take everything into account—including what you are storing and how you are storing it. Did you know that even a lid on a typical banker’s box adds an additional ½ inch of space? In crowded evidence rooms, every inch counts—and simple things like lids, widths and lengths of bins, and heights of shelves all have a huge impact on storage space. Our storage experts can assess your current shelving, talk with you about your ideal situation, and offer solutions on how to best optimize your existing space. Prioritize high-security evidence and weapons storage. Narcotics, firearms, and valuables evidence need to be kept under double security—and if you’re dealing with space inefficiencies and funding issues, you need a solution that can provide the security you need—in the space you already have. Narcotics need a separate, double-locked location apart from general long-term evidence, but another issue is just as pressing—the health risks that prolonged exposure to narcotics odors can cause. The NEL’s ability to reduce and eliminate odors through air extraction integration eliminates these odors and improves air quality, and maintains the needed level of security. Storing firearm evidence can pose a challenge for smaller police departments, as weapons come in all shapes and sizes and often need to be held for an indeterminate length of time. 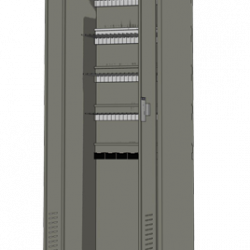 The WEL was created to combine all the essential weapons evidence storage your department needs into a cost- and space-efficient storage system. Short-term handgun storage needs to be highly secure, yet easy to access. 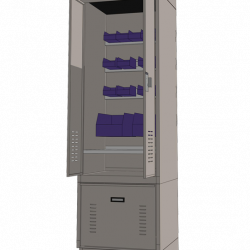 Sally port wall-mounted gun lockers are ideal for interview rooms, common areas, or any location or situation that requires temporary handgun weapon security. 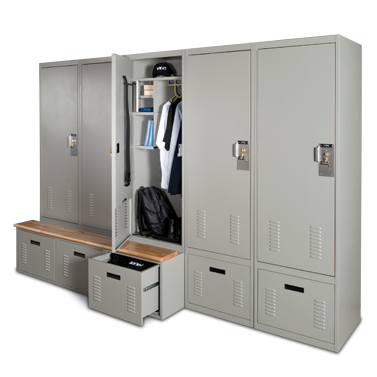 Are your officer’s lockers in need of a facelift? We care a lot about your evidence and chain of custody—but we also care about you. Your equipment needs storage that allows it to keep its integrity—no different than your evidence storage. 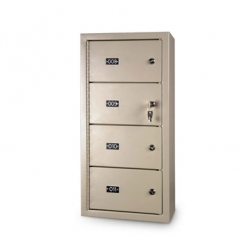 We have retrofit solutions to help you along the way—whether it’s retrofitting your existing officer lockers with bench drawers and drying trays for bulletproof vests, or changing out lock options for your existing storage. Need extra space immediately? You don’t need to wait. Start a conversation with a storage expert for a free space assessment and tips on how to optimize your space now—and in the future.